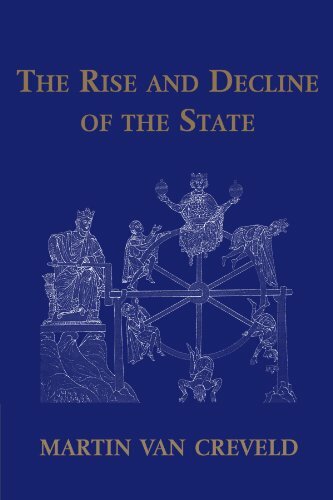 I continue with my review of The Rise and Decline of the State, by Martin Van Creveld. The introduction can be found here. Van Creveld’s opening chapter covers what he describes as the time before the state – pre-history to AD 1300. In this chapter, he reviews tribes – with and without rulers, city-states, and early empires – e.g. China and Egypt. In this post I will focus on his section regarding the city-state. As in all such sweeping views of even a specific aspect of history, much of what is written is a generalization – not all aspects will be found in every city-state. …the outstanding feature of classical city-states was that their citizens appointed certain persons among themselves to govern all of them. …we are talking here not of rulers but of magistrates. The assembly’s main function was to pass laws, known as nomoi in Greece and leges in Rome; but it also elected the magistrates and pronounced the final word on questions of war and peace. The assembly also possessed the right to use ostracism in order to exile those citizens felt to be a public danger – an approach sometimes suggested as viable by those advocating a more libertarian / anarchic solution to certain offenses. Next in importance to the assembly were the various magistrates. Whereas many might be selected by lot, the most important ones were invariably elected… In Greece…the objective was usually to enable as many citizens as possible to rule and be ruled in turn. …election by lot, a method of choosing public officials in some ancient Greek city-states. It was used especially in the Athenian democracy, from which most information about the practice is derived. With few exceptions, all magistrates were chosen by lot, beginning with the archons in 487–486 bc; likewise the Boule (council) of 500 and the juries of the law courts were chosen by lot. The practice of sortition obviated electoral races and provided for the regular turnover of officeholders. The operations of government were thus not in the hands of experts, but, through the system of sortition, the Athenian democracy provided at least some practical political education for its citizens. The rationale of sortition was the equality of all citizens. We could do worse than elect our politicians by lot…wait a minute…we already do worse! Thus, in Athens, the assembly elected a pool of 6,000 potential jurors each year; to forestall bribery, the decision as to who would serve on each court each day was made by lot with the aid of a specially constructed machine…In this way the classical city-state became the first, and for a very long time only, political community to take juridical powers out of the hands of the ruler(s). No magistrate, not even the Roman consuls whose power was greater than that of all the rest, in an ancient city-state possessed the right to inflict capital punishment on a citizen in peacetime unless he had first been permitted to present his case before a citizens’ court…. In the absence of the state as a legal persona against which offenses could be committed, our modern distinction between civil and criminal jurisdiction did not apply. It made no difference whether the matter before the court involved a dispute over an inheritance or murder; instead a line was drawn between cases which involved only individuals and those which, like peculation, treason, impiety, and – in Rome – insulting the greatness or majestas of the Roman people, concerned the community as a whole. In the former cases, the only ones who could bring suit were the injured person or, if he was no longer alive, his relatives; the second type could be prosecuted by any citizen who wished to do so. There is, perhaps, some applicability in this to the concepts of law and justice in a more libertarian / anarchic society. There was little concept of specialized personnel, large administrative bureaucracies, or regular armies. There was no institutional training of personnel for positions in police work, accounting, or diplomacy. The laws themselves, at least initially, came from oral tradition – similar to the discovery of law during the Middle Ages. The expenditures of government were met with market duties and proceeds from the justice system. The most important source, however, was the so-called liturgies – contributions made by the wealthier citizens for specific purposes: staging a play, supplying an exercise hall, or erecting a public building. Beyond any altruistic motives, such payments often helped to increase popularity and therefore gain sympathy from a jury pool – as such wealthy people were certain to be dragged into court on occasion. Voluntary payments for so-called public goods; an interesting idea. Instead of buying off the politicians via “campaign contributions,” they bought off the population directly, thus circumventing the tremendously expensive middle-man. Thus ends Van Creveld’s overview of the governance in an ancient city-state; in addition to my being exposed to this history, it also provides real-world examples of institutional possibilities absent a (or at least via a greatly reduced) central, monopoly state government.